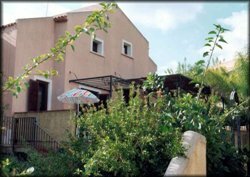 The vacation rental is located at the "Baia dei Turchi" - Brucoli (province of Siracusa), sloping down to the sea, in a natural inlet of extreme beauty and immersed into the green. 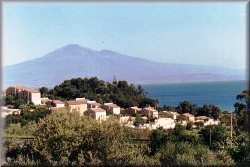 It is close (5 minutes by car) to Brucoli, a small village already well known for its touristic attractiveness and that has not missed its first nature of fishermen's village. Brucoli is characterized by a long natural fjord, a Norman Castle (now also navigation light), shops, restaurants and pubs. From "Baia dei Turchi" it is possible to reach the Augusta rail-station (10 minutes); the Catania Fontanarossa airport (20 minutes); Catania, Siracusa and the Sigonella NATO base (30 minutes); the Etna volcano and Taormina (60 minutes). The complex is a residential settlement within a closed sphere (60000 square metres) composed of very quiet houses (seven Types of in villa self-catering apartments), all with terraces and/or private gardens, graciously furnished and with kitchen. Type D. They have four double bedrooms (two with Air Conditioning), one living room with sofa bed, separate kitchen, and three bathrooms. The settlement is good to satisfy the most various residential needs of either mono or multifamily groups. It is possible to use a wonderful private beach, a "solarium", an amphitheater (built with local stones), a dance floor, and a large (15000 square metres) mediterranean garden next to the beach. The style of all the settlement is the "Old Sicily": it seems an old fishermen's village, built in a simple architecture with soft colored plasters and local stones. Without Sicily, Italy leaves no image in the soul: it is the key to everything (Italian Journey). Hai visto le generose montagne siciliane coperte da vigneti. Hai bevuto a Messina, a Palermo e sull'Etna; Catania ti ha riempito il calice (Georgiche). La verde isola Trinacria, dove pasce il gregge del sole (Odissea).